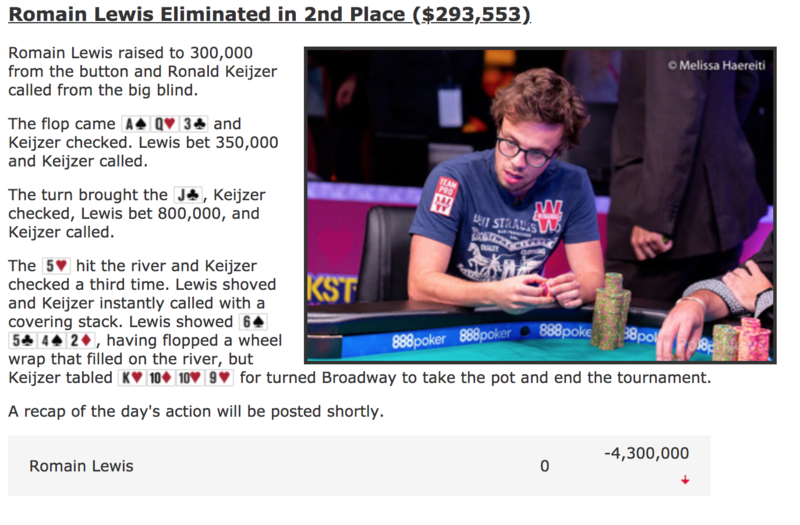 Tags: 2018 WSOP, Romain Lewis, Ronald Keijzer. Being able to outlast a field of 901 entries is an achievement done by Ronald Keijzer, who won his very first bracelet and he takes home with him a plump $475,033 payday in Event #69 $3,000 Pot-Limit Omaha 6-Handed. 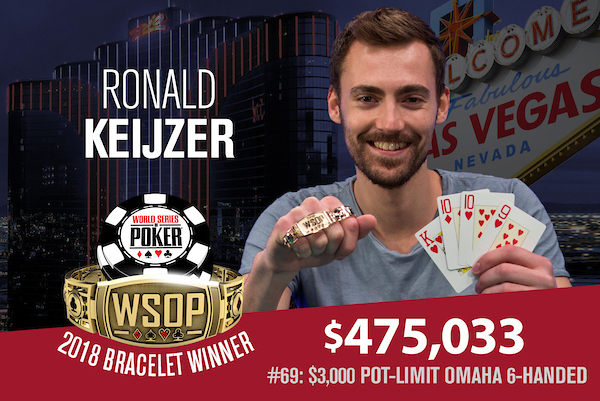 Keijzer, a 26-year-old poker pro from Amsterdam, is the fifth Dutch player in WSOP history to win a gold bracelet. The cash player regular was able to overcome a difficult final table that included the likes of Scott Bohlman who settled in 3rd place, and French poker pro Romain Lewis, who he went heads-up with to win the event. Keijzer said, "I'm very happy. I love PLO tournaments and I came to Vegas especially for that. It was really fast. I joined the table with 1.8 million and in 20 minutes I had 4 million... I think my position on the table was just very good with my stack, the other stacks and a lot of ICM pressure." He plays cash games online usually at home, so a live tournament is a rare thing for him, and in this event, it would definitely be a memorable one for him now that he won the whole thing. Even though he had the chip lead early in three-handed play, Scott Bohlman finished in 3rd place when he got his stack in preflop with Aces against Romain Lewis' suited Ace and a pair of Jacks, making a flush and taking the pot. 7 comments for "2018 WSOP: Event #69: $3,000 PLO 6-Handed won by Ronald Keijzer for $475,033"
A very nice payout for the first place with that buy in. And the game was pmaha also. All the rest they had the lead. This Dutch player's success is a nice one. He is more online poker player and now manages to win a bracelet in a live tournament which is very rare for him to play live. Omaha is a nice game for many professionals players and this pot limit it is an advantage because do not lose the stack once.